Boozy Raspberry Cranberry Sauce is always a favorite in my house. Made with fresh cranberries, juice from fresh tangerines and the ‘boozy’ part is Raspberry Liqueur. 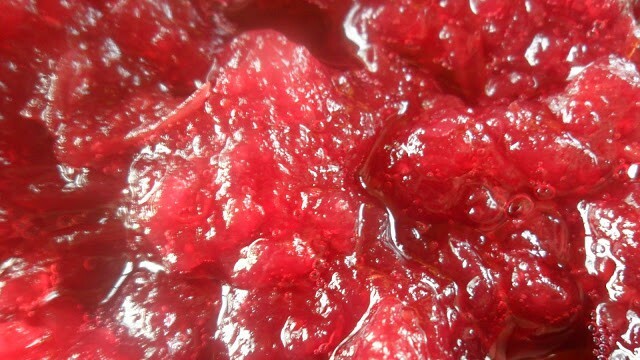 If you want to make this alcohol free, use a 10 oz container of frozen sweetened raspberries, thawed. I prefer to use tangerines instead or oranges when making anything with cranberries. In my humble culinary opinion, Tangerines have a stronger flavor than oranges when added to cranberries. Give it a try and taste the difference. 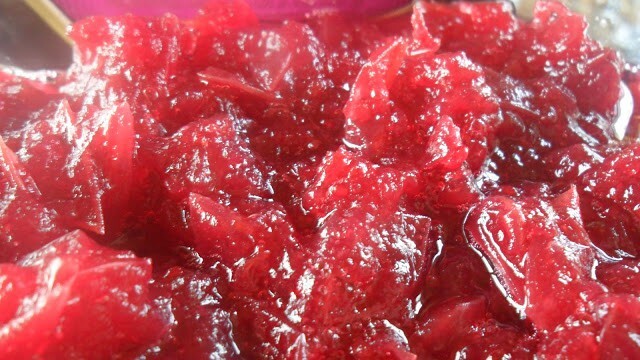 Cranberry Orange Marmalade Bread, Rice Pudding with Cranberry Sauce and Cranberry Bratwurst Bites are just a few ‘cranberry’ inspired recipes we have here on Turnips 2 Tangerines. For more recipes with cranberries, visit our Recipe Box. This recipe calls for an Italian di Amore Raspberry Liqueur. Other Italian Liqueurs we recommend you try from Sazerac are Amaretto and Sambaco. Both are super sippers! Like all cranberry sauce recipes, this one is equally easy. Making your own cranberry sauce takes minutes and it’s so much better than the ‘jellied’ cranberry sauce you buy in a can, even though my kids prefer this version over fresh. I prefer a ‘cooked’ cranberry sauce verses a ‘raw’ sauce, only because there are so many different ways to serve a cooked sauce. One of our favorite ways to serve cranberry sauce is with pork tenderloin or with any game meat. A fast, easy and boozy cranberry sauce. In medium saucepan, combine water and sugar. Bring to a boil; add cranberries. Reduce heat, simmer 10 minutes or until cranberries start to pop. Stir in juice from tangerines and raspberry liqueur or juice. Simmer for an additional 10 minutes. Remove from heat. Stir in tangerine zest and salt. Set aside to cool.